It’s been less than three weeks since I returned from Cornwall, but already the alembic of memory is distilling the random incidents of that trip into stories fit for re-telling. One such story I’ve begun to think of as the Mystery of the Dead Hand. We were staying near the fishing village of Mevagissey on the south coast, a place perhaps a little too in love with its own charm, full of shops selling the worst kind of kitsch to tourists. The town’s museum was so funky and down-home as to be either wonderful or terrible, depending on one’s perspective. But our campsite was adjacent to a genuinely great attraction, the Lost Gardens of Heligan — lost because all the gardeners of this grand Victorian estate were killed in World War I, and it fell into ruin for the next seven decades. The garden itself is filled with a gentle melancholy and there have been a number of reports of figures around the wishing well. The most sinister occurence relates to an area known as ‘The Lost Valley’ where the gardens go into a wooded ravine towards Mevagissey. Apparently, one of the restorers encountered a monstrous black shape which rose up and dissipated through the trees. Investigation of the area revealed a pentangle pegged out in the ground giving rise to the suspicion the deserted gardens may have been used for Satanic rituals. This incident followed a period when the team restoring the gardens felt a collective oppression culminating in the tragic death of one of the team’s family in a house fire. As it happened, the Lost Valley was adjacent to a cottage owned by Rachel’s friend F. We had stayed there for the first three nights of our holiday before moving up to the campground to make room for more guests, but we continued to socialize down there throughout our visit, often walking through the gardens to admire the old trees. F told us about one route from the campground we could take, which involved following the bike path to Mevagissey and taking a short-cut down into the Lost Valley through what she called the mossy tunnel. When we finally got a chance to explore it one morning, F’s description turned out to be not at all fanciful. 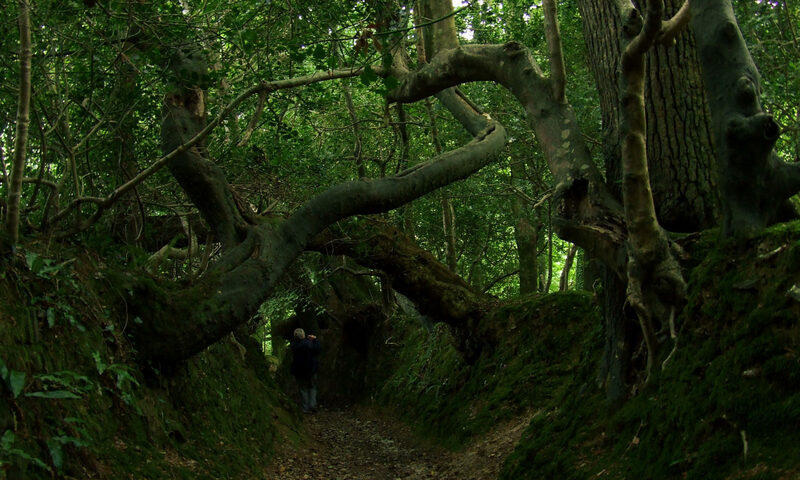 The ancient public right-of-way may be a short example of what’s known in Britain as a holloway (or hollow way), a road that’s been in use for so many centuries that its surface is now well below the surrounding fields. The distant booms of World War I artillery — a practice run for a commemorative program at the Gardens two days later, on the 100th anniversary of Britain’s entry into the war — faded as we descended into the hollow, absorbed by the thick moss and the great, gnarled oaks bent low over the trail. Soon we both had our cameras out and were snapping away. But what little sun there had been earlier had gone away, and with the darkness of the foliage, lacking a tripod as I did, it became difficult to get a clear shot. I glanced in and saw something pale and fingery hanging down. Just a fungus, I thought. But then she pointed her iPhone at it and pressed the torch (flashlight) app. “Um, maybe some farmer left his glove in there?” I said. “Gloves don’t have lines and callouses and dirt under the fingernails,” she said. I had to admit she had a point. I looked up inside. The hand terminated half-way up the arm and was dangling from a cord that had been threaded through the wrist. “How about if we poke it with something?” I said. It seemed like the best way to prove it was just a very realistic fake. But what if it was real? “I’m not sure we want to be tampering with possible evidence,” Rachel said. Evidence of what, though? To me, the Tolkienesque location could be no accident. If this were a real human hand, it must be intended as a charm or fetish object, hung here to gather power. I thought of the display on witchcraft at the Pitt Rivers Museum in Oxford which we’d seen earlier in the summer. Rachel’s mind ran more toward psychotic serial killers. Those weren’t mutually exclusive scenarios, of course. There were two cottages close by, inhabited by an elderly woman and her daughter, but F.’s cottage was only about a hundred yards up the other side of the ravine, so we decided to go there instead. She wasn’t expecting us, and seemed startled when we walked in. We showed her the pictures on our cameras. She’d never seen anything like it either. Even if the hand was fake, it was frightening to think of what sorts of things people might be getting up to so close to her idyllic get-way. So it was that we came to call the local police about a possible human hand in an old tree adjacent to the Lost Gardens of Heligan. We figured there was only a slim chance that it might be the real thing, but best to play it safe, and when the first policeman arrived a half-hour later, we told him we fervently hoped we were wasting his time. A local resident, he exuded unflappable calm and savvy. While F stayed to wait for the other two cops, Rachel and I took him to the tree. “Oh yes, that’s fake,” he said confidently almost as soon as he saw it. Nevertheless, he donned rubber gloves before he touched it. “I’ve seen things like this before,” he said as he pulled it down. It squashed in a rubber-like manner. “But very realistic, indeed!” he added charitably. He radioed the other cops, then began to try to cut the stretchable cord, which had been fastened somewhere far up inside the tree. Then he did a double-take, and pulled off what turned out to be a lid on the upper end. A small glass canister came out. We leaned in for a closer look: it was empty. What the hell? “This is a geocache container,” he said. He was indeed a very knowledgeable policeman. It turned out he’d seen someone doing something suspicious in a Mevagissey phone booth a while back — reaching up behind the phone and acting furtive — and when he questioned the guy, he turned out to be a geocacher and filled him in on the sport, a kind of high-tech scavenger hunt using GPS. We were left with the task of explaining to the neighbors why there were policemen coming around. Everyone wanted to look at the hand, of course, but now it had rotated so that the palm wasn’t showing, and having been recently handled, it no longer looked nearly so realistic. When Rachel and F’s teenaged sons came to look a little later, they couldn’t believe we’d been so credulous. “It’s so obvious that it’s a fake,” said A with the know-it-all tone that only a 14-year-old can muster. Just wonderful. If you live near those trees and travel on a hollow way, aren’t you obligated to leave a hanging hand? I want an entire book of photographs on these museum exhibits. Thanks, Julia. The Pitt-Rivers Museum is especially wonderful; two hours weren’t enough time to take it all in. A total cabinet-of-curiosities style place. Good find! I’ll keep an eye out for it. Dave, you are a formidable storyteller – and, eek, the hand is very realistic! Thanks. Isn’t it, though? Apparently such things are not purchased in an ordinary costume shop, either. Blimey! That was an emotion-filled five minutes…. Wow, what a great experience and description of it and how lucky that you were the ones to stumble upon this ‘geocache’. I’ve never heard of this sport? game? pursuit? Makes me think that having a camera on hand is essential wherever and whenever. Speaking of cameras, Rachel has just uploaded a cellphone photo of the tree as we first saw it, with the fingers of the hand just visible.